This page contains information specific to Bioversity for workshops facilitated by Wikimedia Community Malta trainer Toni Sant since 2016. 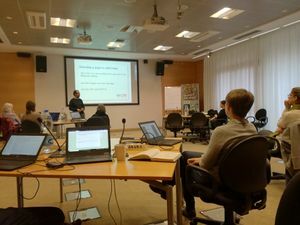 Following up on the successful workshop in 2016 this event was designed to provide a further training opportunity for new Wikipedians and a refresher on the basic essentials for anyone already editing Wikipedia and/or exploring other Wikimedia projects. If you like, you can also learn a little about editing ahead of time here or here. Goal for the day: explore the power of Wikipedia as a knowledge-sharing tool and learn editing basics. * denotes attendee who attended the workshop remotely. The workshop is coordinated for Bioversity by Marta Millere. The first Wikipedia Editing Workshop for Bioversity by Wikimedia Community Malta trainer Toni Sant was held on 29 September 2016. 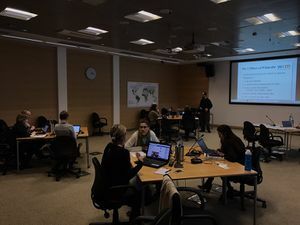 This workshop was coordinated for Bioversity by Ewa Hermanowicz. This page was last edited on 3 February 2018, at 12:29.